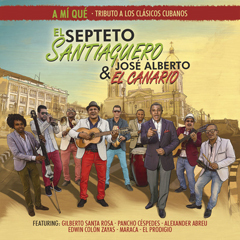 CD Review: A Mi Qué by Septeto Santiaguero with José Alberto "El Canario"
Although there are plenty of one-off international collaborations between various bands in Cuba and musicians in other countries, El Septeto Santiaguero has emerged as the indisputable king of the international project phenomenon with its body of work over several albums including this newest one, A mi qué, the second album with Dominican José Alberto "El Canario" sharing top billing. This project's extensive guest artist roster also adds a number of Cuban guest artists including string and wind ensembles from the Orquesta Sinfónica de Oriente in a couple of tracks, and the engineering team is as international as the musician roster. The full tittle is A mi qué- Tributo a los clásicos cubanos, and the songs are quite familiar, but there is a slighly different interpretation of some of them - strong Rumba elements in La Guarapachanga, a very changüi El guararey de Pastora, a touch of walking bass and moments of beatboxing in A mi qué to mention just a few examples. Through it all, however, the Septeto remains in charge, and the songs never lose their Cuban sense of direction. It helps that the visitors, especially El Canario, who is such a key part of the vocals, take Cuban stylings very seriously (yes, El Canario had his brief little gaffe with the Timba - the genre, not the website - community in recent months, but no reasonable person would question his love and respect for Cuban music generally). I have opined on countless occasions that if one is recording the 50th or 60th version of a song, there is an obligation to say something distinctive with it while avoiding the corny. A mi qué succeeds on this point. As this is being published, A mi qué is not yet available in the digital stores, but we anticipate that it will be in the very near future. Lead Vocal 2, 4, 6, 8, 10. 12; Human Flute 1, 9 José Alberto "El Canario"
General Production Assistant Fernando Dewar Jr.